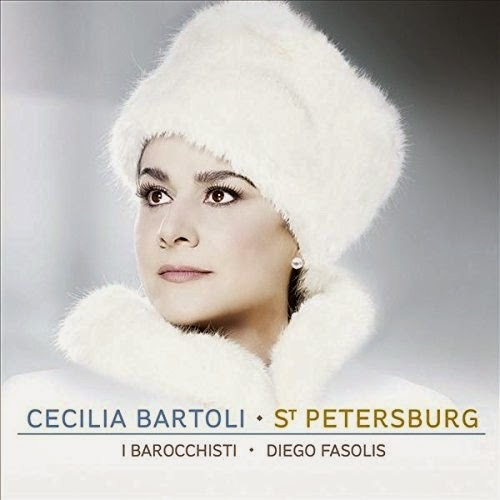 This latest disc from mezzo-soprano Cecilia Bartoli is full of arias you have never heard from unknown operas by obscure composers, but that is nothing new. In her recent discs, Bartoli has showed a knack for discovering and re-animating forgotten repertoire. On this disc from Decca, recorded with Diego Fasolis and I Barocchisti, investigates the music written for the opera in St Petersburg in the 18th century. During this period the Russian Court relied on foreign models for much of its high culture and for opera they looked to Italy. On this disc there are arias from operas by Francesco Araia, Hermann Friedrich Raupach, Vincenzo Manfredini, Domenico Dall'Oglio and Luigi Madonis, and Domenico Cimarosa. This latter being the best known of the group. The music is all taken from manuscripts houses in St Petersburg's Mariinsky Theatre Library, coming from the Italian Collection. Neapolitan composer Francesco Araia was in Russia from 1735 to 1759, under Empresses Anna Ioannovna (Peter the Great's niece) and Elizabeth (Peter the Great's daughter by his second wife). Araia was the first composer to have an opera performed in Russia and the first to set a Russian libretto. Appropriately enough Bartoli opens with the aria Vado a morir from La forza dell'amore e dell'odio, that first opera performed in Russia which received its premiere in 1736 at the Winter Palace. This is a graceful piece with a melancholy lyric vocal line which shows off Bartoli's voice to the best. She follows this with something by Hermann Friedrich Raupach who served Elizabeth for just two years from 1759 to 1761.. His opera Altsesta was in Russian, and Bartoli sings two arias. Razverzi pyos gartani, laya which opens with an explosion of trumpets and drums. Fazolis takes the piece at quite a lick, providing a vivid accompaniment and Bartoli joins in, spitting out the words. Her passagework is as assured as ever, but the microphone does rather catch her notable vibrato too. Perhaps the result is a bit wild, but it is very vivid. Idu na smert from the same opera is a slower, graceful piece which Bartoli gives a lovely shaped line over the more moving accompaniment and there is a rather robuster contrasting middle section. According to the notes, not much of Raupach's output survives but these two arias do leave me rather curious. Raupach's Italian opera Siroe, re di Persia provides the next aria, O placido il mare. This is a lively piece full of blaring horns. Again, Fazolis takes the piece at a brisk speed and Bartoli responds with bravura fireworks. The next piece is a real curiosity. Johann Adolf Hasse's opera La clemenza di Tito (based on the same Metastasio libretto used by Mozart) was performed to celebrate the coronation of Empress Elizabeth in 1742. For the performance, a special Prologue was written by Domenico Dall'Oglio (who was probably a pupil of Vivaldi and Tartini) and Luigi Madonis. From this comes Dei miei Figili, a lyric aria with a lovely flute obligato. The vocal line is not uncomplicated, and has a tendency to wander a bit. The accompaniment is predominantly continuo with the orchestra playing a small role. Vincenzo Manfredini was appointed by Elizabeth's successor, her nephew Peter. Peter's rein was short-lived and he was followed by his wife, the German-born Catherine the Great. Manfredini was only in his twenties when in Russia and left when Galuppi arrived (none of Galuppi's music is on the disc). Bartoli sings from Manfredini's opera Carlo Magno. Fra' lacci tu mi credi has a darkly expressive introduction and it alternates expressive sections with vividly dramatic ones. Next we return to Araia for his Seleuco, with Pastore che a note ambrosa. This starts with a long orchestral introduction with a lovely oboe solo, and when the voice comes in Bartoli joins the oboe. The results are nicely expressive though Bartoli's voice sometimes betrays her in the way it smudges the sense of line. The march from Raupach's Altsesto comes next. This is a large scale, grand piece with trumpets, and is lively and very toe-tapping. Then we return to Manfredini's Carlo Magno for Non turbar que'vari rai which is another graceful piece with flute and Bartoli provides graceful vocals to match. Her vibrato here serves to re-inforce the fragility of the music which works in the context. Manfredini provides a rather striking triple time middle section. Cimarosa is not only the best known composer on the disc, but he is the one who work for Catherine the Great (she was the wife of Elizabeth's nephew, the short-lived Peter). Agitata in tante pene from La vergine del soli has a brilliant long introduction with trumpets and echo effects. The vocals are similarly showy, Bartoli starts off with a long messa di voce before the piece works up to some fabulous passage work. This is vivid and stylish performance of an interesting work, one which includes clarinets. Finally we return to Carlo Magno with a big choral finale, the lively A noi vivi donna eccelsa. The music on this all fascinating and enticing, making one rather interested to hear what the full operas are like. Quite rightly Bartoli has concentrated on the lesser known novelties, but I am also curious about the operas written in Russia by Galuppi. How you really react to the disc though, will depend on how you feel about Bartoli's voice. She undoubtedly has superb technical control, and can rattle through passagework with bravura and evenness like no other, but this is often combined with a strong vibrato. This she too can use expressively. She is wonderfully supported by Diego Fazoli and I Barocchisti who produce some simply brilliant playing. The many solo moments are superbly done, and all the players cope incredibly with some of the fast speeds. If the idea of exploring the 18th century Italian opera written in Russia appeals at all to you, then this is your disc. Bartoli's use of her voice is distinctive perhaps, but she is an intelligent and musical performer and I can live with a little vibrato when faced with such a delightful mixture of unknown music.